Sergey Rybachenko raises from the button and Noah Bronstein three-bets from the button with Rybachenko calling. Bronstein gives up two and Rybachenko takes one. Bronstein check-calls the Rybachenko bets and takes one card. Rybachenko takes one as well and they both muck. Bronstein takes one and Rybachenko pats. Bronstein fans and takes the pot. 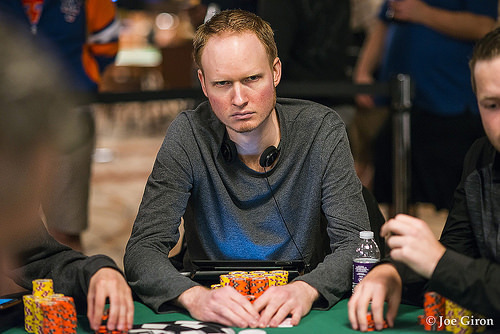 Action folds around to the blinds where Brock Parker raises to 60,000 from the small. Benny Glaser defends. Parker is pat the whole way, and he puts out the first bet of 30,000. Glaser draws three and calls, then draws two on the next round. 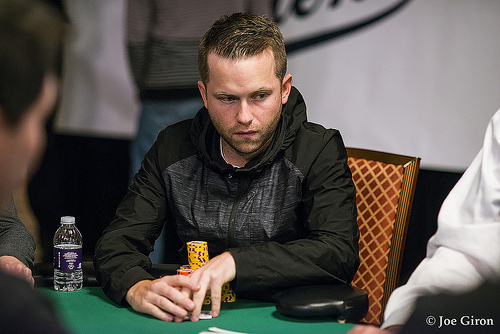 Parker's 60,000 chips are already in the pot, and Glaser calls again. Both men are happy with their hands and pat the last draw. Parker bets, and Glaser calls. Parker shows , just barely pipping Glaser's . The deuce plays for Parker, and he nearly doubles up with that pot. He now has exactly a half million chips. Brock Parker raises from the cutoff and Andrew Brown calls from the big blind. Both players take two cards and Brown bets 30,000 and has 30,000 behind. Parker raises and Brown calls all-in. Brown takes one and Parker draws two. For the final draw, Brown takes one and Parker pats. Brown worries he might be drawing dead and indeed he is when Parker fans that beats Brown's draw. Sergey Rybachenko opens to 60,000 under the gun, and Noah Bronstein three-bets to 90,000 on the button. Rybachenko makes it four bets for 120,000 total, and Bronstein calls. Rybachenko is pat the whole way. Bronstein draws two cards and calls the first bet of 30,000. Then he draws one more and calls the big bet of 60,000. He draws one more on the last round, and both players check. Rybachenko fans to win the pot with a ninety-eight. Not long ago, he was dangerously on chips, but the Russian pro has laddered his way up into second place with the limits now becoming a real factor. Sergey Rybachenko raises to 60,000 from the cutoff and Andrew Brown puts his last 50,000 in the middle on the button. 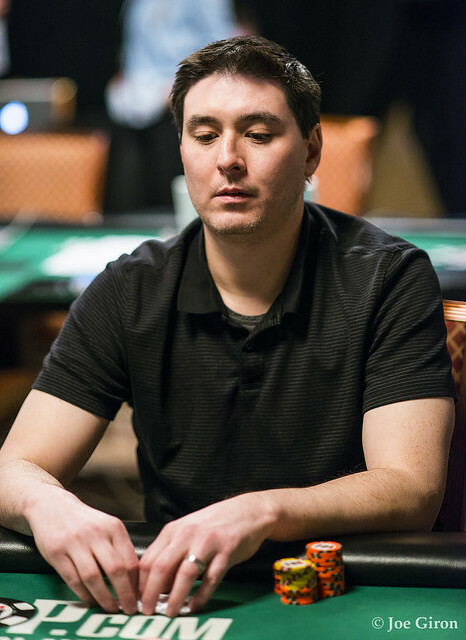 Brock Parker calls Rybachenko's raise in the big blind and draws two. Rybachenko draws one, as does Brown. Parker check-calls a Rybachenko bet and takes another card. Rybachenko pats, and Brown takes one more. Parker check-calls again, and the player goes to a third draw. Parker takes one and Rybachenko pats again. Brown, thinking the hand is complete, makes a motion to muck his cards, but realizes there is one draw left in the nick of time. He takes one. Parker and Rybachenko check. Parker mucks, and Rybachenko shows , but Brown fans a surprise wheel to triple up with . It's time to color up the yellow 1,000 chips, so the players are off for a 20-minute break. Noah Bronstein raises to 50,000 under the gun, and Brock Parker calls one seat over. It's heads-up to the draw. Both players draw two cards, and Bronstein bets 25,000. Parker calls, and they both improve to a one-draw for the second round. Parker calls another bet, 50,000 this time. Bronstein is pat forthe last draw, and Parker draws one more. When Bronstein bets the last 50,000, Parker calls. "Eight perfect," Bronstein announces. He fans to prove it, and the pot is pushed his way. Bronstein has now taken a sizable chip lead in this five-handed match. Noah Bronstein raises from under the gun and Benny Glaser three-bets from the button. Bronstein calls the raise and takes two cards. Glaser stands pat and bets after being checked to. Bronstein calls and takes two more while Glaser pats again. Bronstein checks and Glaser bets. Bronstein calls and takes one card. Glaser pats for the third time. Bronstein bets and Glaser calls on the last street. Bronstein shows for the wheel and spins his way into the chip lead. Benny Glaser opens to 50,000 in the cutoff, and Sergey Rybachenko three-bets to 75,000 on the button. Glaser calls. Glaser draws two cards and checks. Rybachenko draws one and bets, and Glaser calls. On the second round, Glaser improves to a one-draw and checks again. Rybachenko is pat, and he bets 50,000. Glaser eyes up his remaining stack and raises. Rybachenko calls all in for an additional 47,000, and they both pat the last draw. 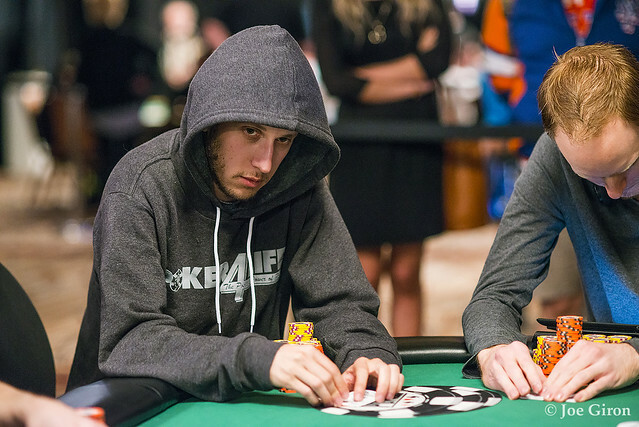 Glaser tables his with cautious optimism, but Rybachenko slams over a superior to double up. Brock Parker opens the button to 50,000, and Sergey Rybachenko makes it three bets for 75,000 from the big blind. Parker calls. Rybachenko draws one card and bets; Parker two and a call. Rybachenko is pat now, and Parker draws the same two. Rybachenko bets 50,000, and Parker calls. Parker improves to a one-draw for the last round. Rybachenko pats and bets, and Parker shrugs and calls. Rybachenko shakes his head and holds his cards over the muck. Parker takes his cue to fan , and Rybachenko's cards drop face-down. Andrew Brown raises to 50,000 from the button leaving himself 38,000 behind. Brock Parker calls from the big blind and they both draw two cards. Parker bets 25,000 and Brown gets the rest of his money in the middle. Parker calls the additional 13,000 and takes one as does Brown. Parker decides to take one more and Brown stands pat with a saying, "I'll take my chances." Parker has a draw but catches an to give Brown the pot. Action folds to the blinds where Benny Glaser raises to 50,000 from the small. Sergey Rybachenko defends his big blind, and his stack is getting short as this hand progresses. Glaser draws two cards and bets. Rybachenko draws three and calls the 25,000. Glaser pats now, and Rybachenko draws three more. There's already a bet of 50,000 in the middle from Glaser, and Rybachenko squeezes his new cards and calls. They both pat the last draw, and they both check. Rybachenko tables , and Glaser appears far from pleased as he mucks with a sigh. Andrew Brown opens the button to 50,000, and Noah Bronstein three-bets to 75,000 from the small blind. Brown calls and draws two. Bronstein draws one and bets, and Brown quickly surrenders. On the next hand, Bronstein is the one opening the button to 50,000. Benny Glaser defends his big blind. Both players draw two cards, and both of them check. They draw two apiece again, and Glaser leads out for 50,000. Bronstein calls. Now it's one card apiece, and the action checks through again. "It's good," comes the reply from Glaser. Bronstein fans to win the pot. Jon Turner raises all in from the button for his last 35,000. Noah Bronstein raises the action from the small blind to 50,000 and Brock Parker calls in the big blind. Bronstein takes one while Parker and Turner take two. Bronstein leads out for 25,000 and gets Parker to fold. Bronstein pats the last two draws and Turner takes a single card twice. Bronstein flips over and needs to dodge the outs of Turner . Turner peels a that is no good and he hits the rail with his second final table in a week after finishing 5th in the $10,000 2-7 Single Draw. Under the gun, Toby Mulloy moves all in for 31,000. Andrew Brown inquires about his options and raises to the full 50,000. Sergey Rybachenko defends his big blind, and it's three ways to the draw for Mulloy's tournament life. Mulloy draws two-one-one. Brown and Rybachenko draw one card apiece on the first round, and it goes check-check. It's one and one again for the second round, and Brown's bet of 50,000 chases Rybachenko out of the pot. Mulloy receives his last card, and Brown pats and tables . Mulloy is drawing live with a four-card , but he flips up a useless to seal his fate. Toby Mulloy started the day atop the chip counts, and his deep run ends with a final table bubble in this ruthless event. He earns a five-figure payday for his work this week. Noah Bronstein opens to 50,000 on the button, and Benny Glaser three-bets to 75,000 in the big blind. Bronstein calls. Glaser is pat, and he puts the first bet of 25,000 into the middle. Bronstein draws one and calls, and he draws one again on the next round. Glaser pats again, and his bet of 50,000 is enough to coax a fold from Bronstein. That's the end of Level 25, and the players have decided to take their one-hour dinner break now. Action resumes at 9:00 PM. Brock Parker draws one from the big blind and Benny Glaser takes one from under the gun. Jon Turner takes two and Parker checks to Glaser who bets. Both Glaser and Turner call. The draw action is the same the second time around and Parker checks again. Glaser bets and Turner raises. Parker folds and Glaser calls. Glaser takes one more and Turner pats. Glaser bets, Turner raises and Glaser calls. Turner mucks and Glaser shows . Glaser now sits with half of the chips in play with seven still left.